You know what the best way to prepare steak is? In a cast iron skillet. Yup! Not even kidding. 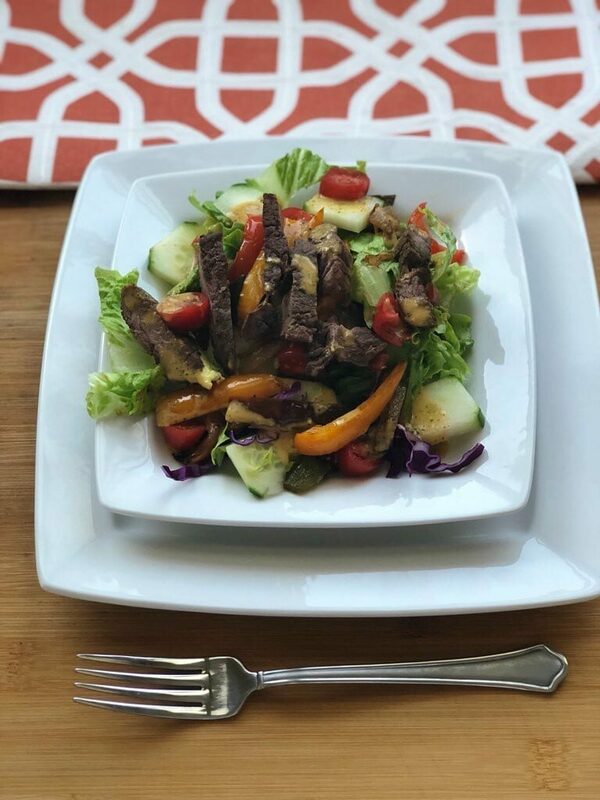 I created an incredible Steak Fajita Salad that uses, what I call, a “Cast Iron Skillet Steak” that is to die for. Enjoy a steak every now and then? Wonder which cut of steak is the best to grill or pan fry? There are so many different cuts to choose from, some are best for grilling, some better for crockpot cooking, it really depends on what you want to do with it. For my Steak Fajita Salad, I prefer to cook my steak in a cast iron skillet. 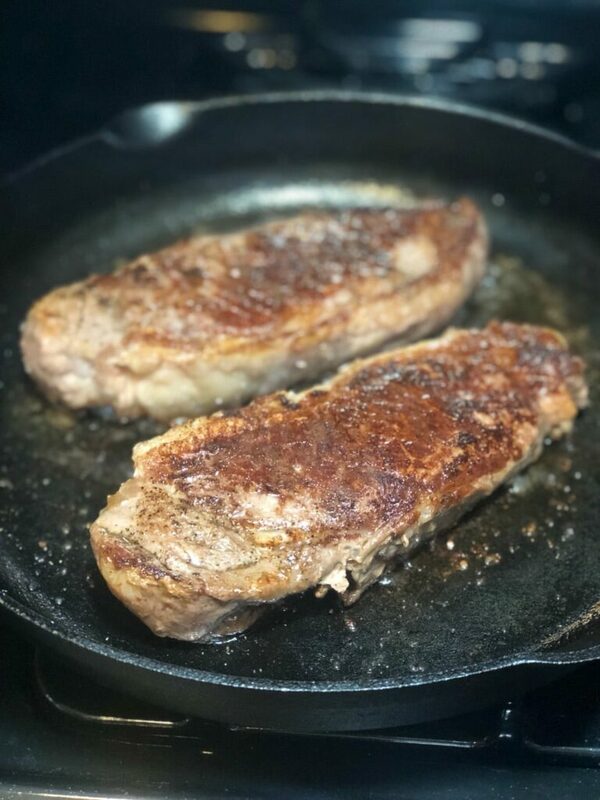 The best cut of steak to cook in a cast iron skillet is the New York Strip and luckily enough they have been on sale lately. We don’t eat beef too often but when we do I like to pair it with a salad because the beef is heavy, having it with a salad balances the meal. One strip is enough for a giant salad to serve 3-4 people. 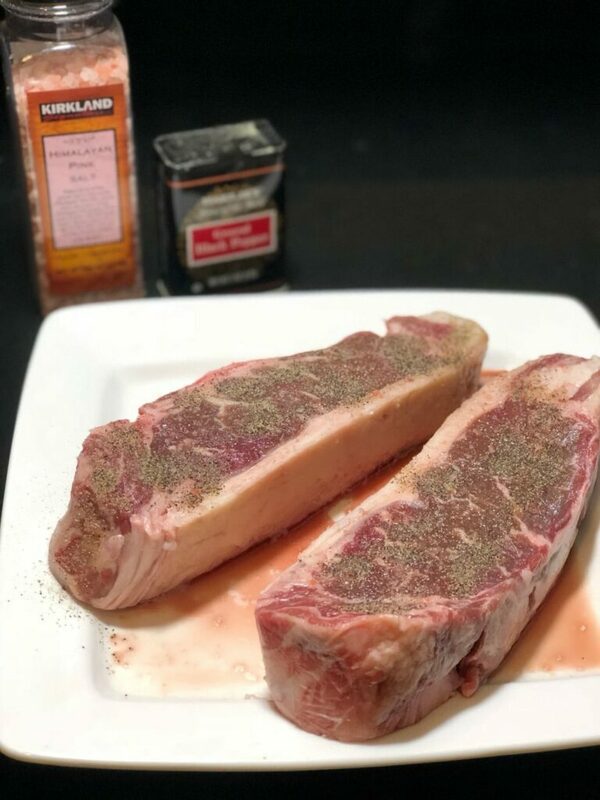 Here is how I cook my New York Strip and the salad I love to pair it with! What Is the Best Cast Iron Skillet to Cook Steak? You can’t beat a classic. Even America’s Test Kitchen agrees – the best-cast iron skillet is the Lodge Classic Cast Iron Skillet. Buy the 12″ skillet for the perfect steak! Here’s how to cook the perfect steak in your cast iron skillet. Everyone loves a steak on the grill especially during the summer months, but sometimes it’s just easier and not worth the hassle to get all your BBQ tools out to cook one steak that you are going to eat indoors anyways. Sometimes I just like to cook the steak quickly in my Cast Iron Skillet. 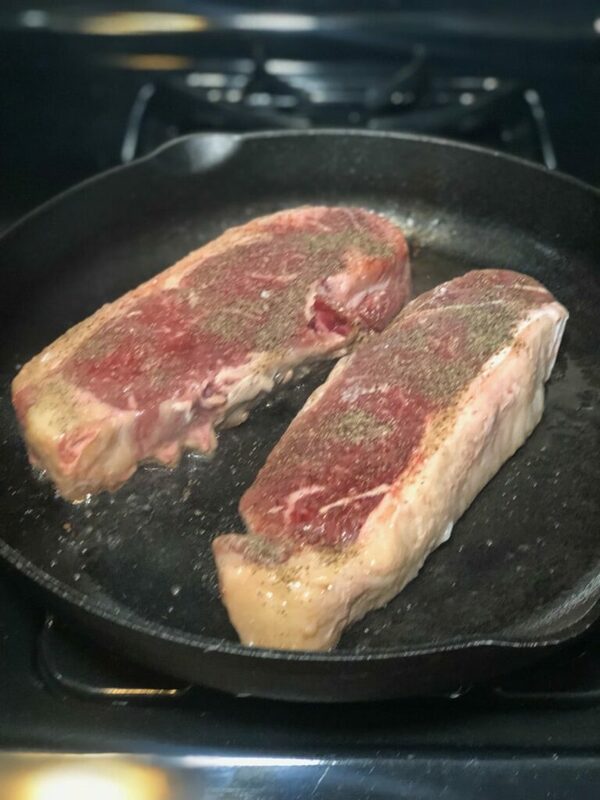 If you don’t have a Cast Iron Skillet this is a great item to have in your kitchen because its durable and will last a long time, but also you can sear meat in them and then finish it off in the oven. To cook a steak heat cast iron skillet on high with 1 TBS of ghee, once the skillet it hot reduce heat. While the skillet is warming, salt, and pepper both sides of the steak to your liking. Add the steak to the skillet and cook for 4 minutes or until browned. Flip the steak over and cook for another 4 minutes or until browned, insert a meat thermometer (this is the one I use) turn on and set to the desired temperature depending on how you enjoy your steak. I cook my steaks to medium which is 140-145 degrees and for medium rare it is 130-135 degrees. Note: make sure your thermometer is set to Fahrenheit and not Celsius, I have made this mistake before. Once your steak has reached the desired temperature remove from oven and let rest for 10 minutes. After the steak has rested, serve and enjoy! Now that you have the perfect steak, I have a salad recipe that is divine! Make the steak in a cast iron skillet for a fresh and crispy salad. In a frying pan heat olive oil and add peppers, onions, and jalapeño and stir well to coat with olive oil. While your peppers and onions are cooking, prepare your salad. Mix the romaine and cabbage in a large salad bowl, top with cilantro and tomatoes. 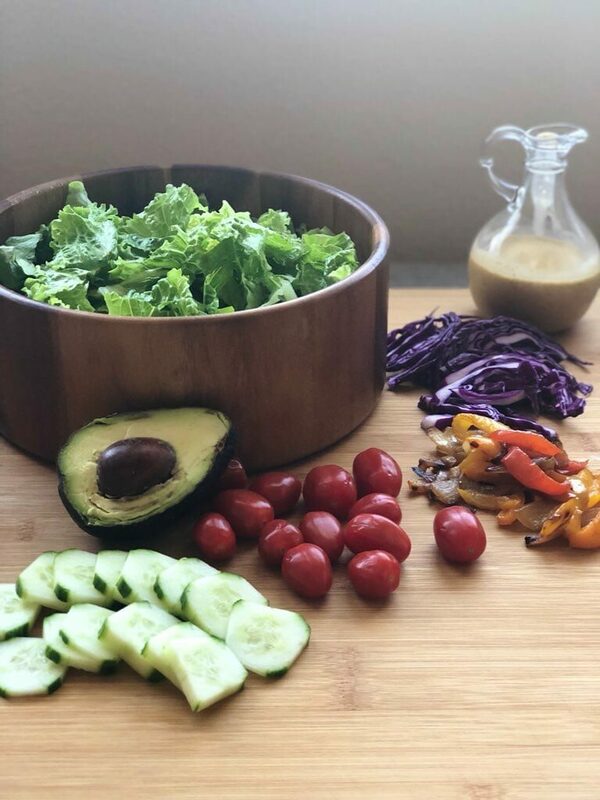 Once the peppers are cooked down and caramelized plate the salad, add dressing, add fajita veggies, and top with steak and avocado, or simply toss all the ingredients up and then plate. Follow these tips and you’ll have a fresh salad full of the tastes and flavors of a backyard garden. Pin this recipe so you can have it for later. 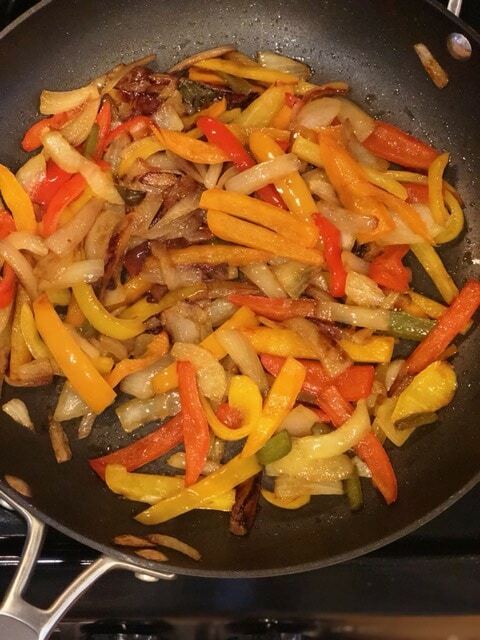 In a frying pan heat olive oil and add peppers, onions, and jalapeño and stir well to coat with olive oil. 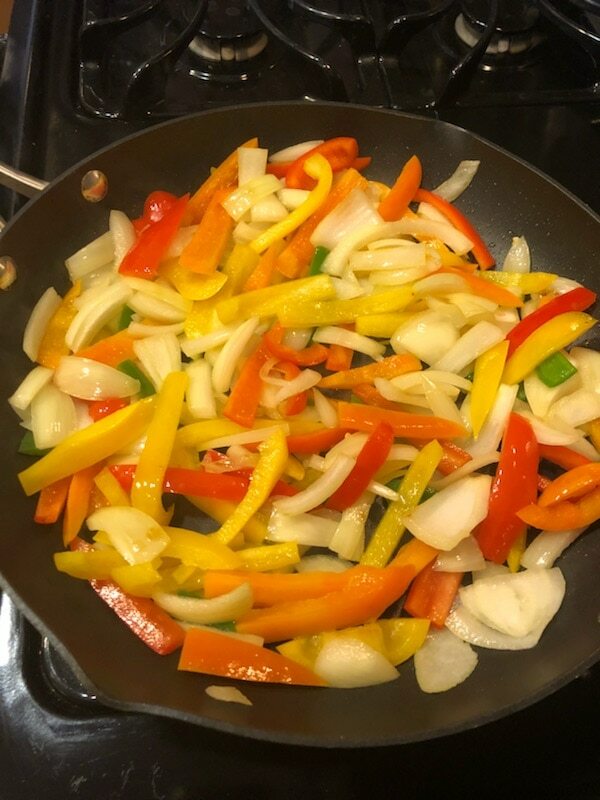 The trick to sautéed peppers and onions is to cook them long enough to caramelize for the best flavor, to do this reduce the heat to medium and let them do their thing stirring every 5 minutes or so until softened and browned, about 20 – 25 minutes. 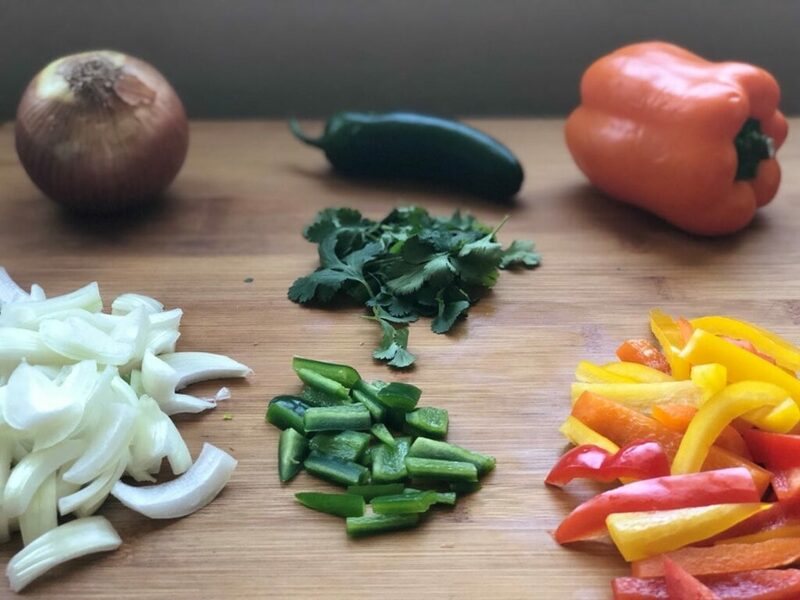 Once the peppers are cooked down and caramelized, plate the salad, add dressing, add fajita veggies, and top with steak and avocado, or simply toss all the ingredients up and then plate, totally up to your preference. 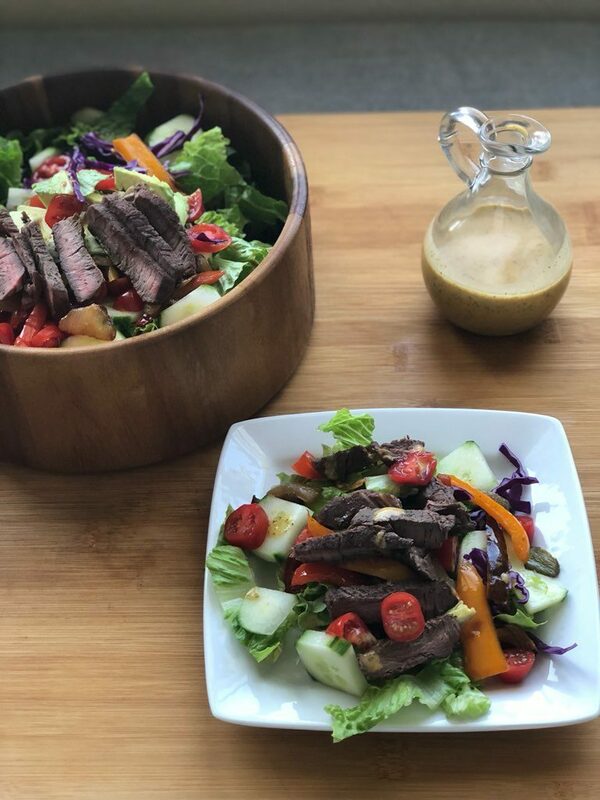 I don’t toss the salad because we typically have leftovers and by keeping fajita veggies, steak, avocado, and steak separate the salad will stay fresh and we can enjoy for lunch the next day. 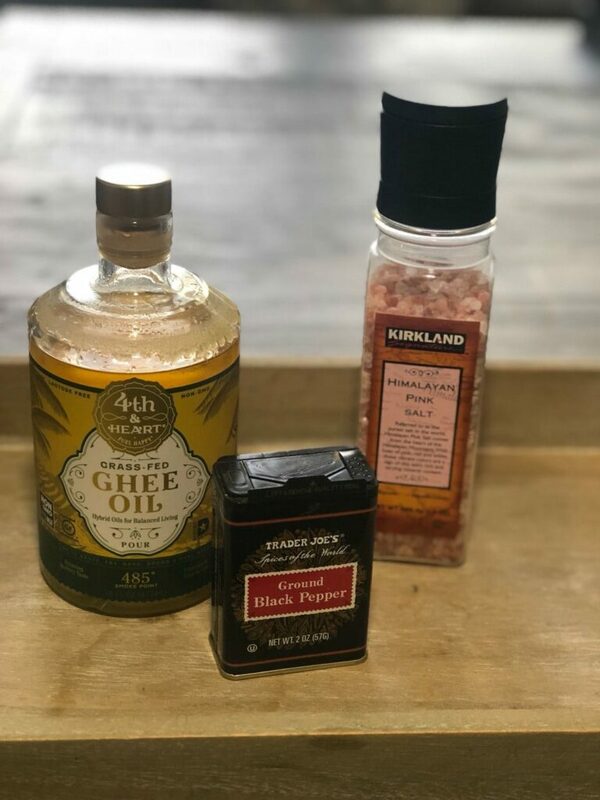 What Is The Best Salad Dressing For Steak Salad? This is up to you. If you are a fan of cilantro (like I am), then you will love the Trader Joe’s Creamy Cilantro dressing. It has a zing that brings out the depth of the steak’s flavors. Hope you enjoy this tasty salad! 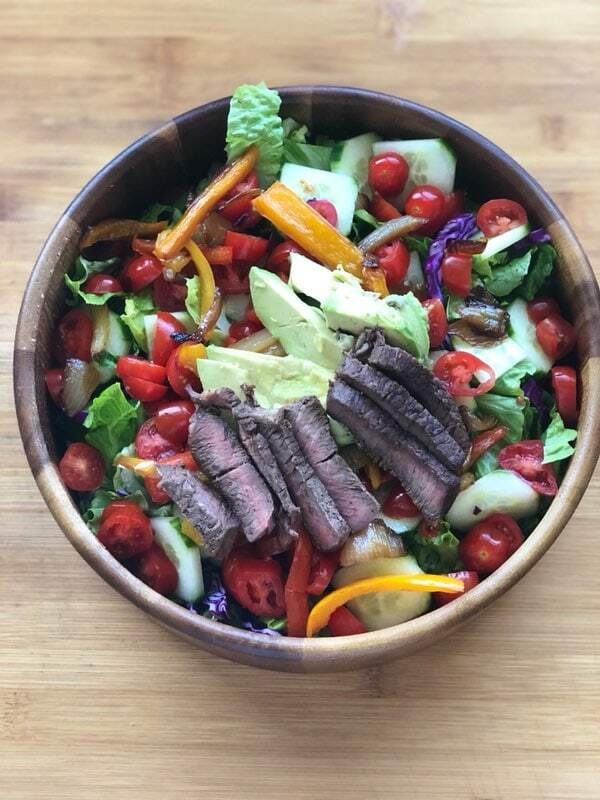 If you enjoyed this Steak Fajita salad recipe made with cast iron skillet steak, you’ll want to make these fresh salads too.